It’s officially Fall and there is a crispness to the air now. 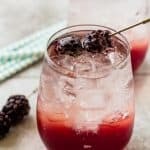 Let’s celebrate with a crisp light cocktail made with fresh blackberry syrup and sparkling water, my Blackberry Coconut Splash! Combine the blackberries, water, and sugar in a saucepan over medium heat. Bring to a boil and stir until the sugar dissolves. Remove from the heat and let cool for 5 minutes. Strain the syrup through a mesh or sieve to remove seeds and skins. Store the blackberry syrup in the refrigerator until ready to use. Lasts up to 1 week. Add 2 tablespoons blackberry syrup to the bottom of a glass. Add 1-ounce vodka to each glass. Garnish with blackberries on skewers, fresh or frozen.